Tommy Trerise a junior from Renaissance High School in Bremerton, WA performs at EduHam. The Paramount Theater has been buzzing with chatter for weeks now with the monthlong Hamilton run. But the fervor reached new heights on March 14 when 2,800 students and teachers from the Seattle and Portland area were finding their seats and getting ready to cheer on their fellow classmates as they performed original work inspired by the early American history covered in the mega-popular musical. The Hamilton Education Program (better known as EduHam), made this moment possible by offering subsidized tickets to students who are studying the Founding Fathers. As part of the curriculum, students get to attend a performance of Hamilton for $10 (subsidized by Pivotal Ventures, the Executive Office of Melinda Gates and the Schultz Family Foundation), participate in a cast Q&A and watch their peers perform original songs, raps, poetry and monologues based on historic events. A cast member from Hamilton walks out to introduce the program. Conroe Brooks is part of the ensemble, and the host of today’s EduHam program. Before the first student performer comes out, Brooks recognizes that it is National School Walkout Day and because these kids didn’t have a chance to participate due to the performance, he wanted to take a moment of silence to honor the victims of the Parkland school shooting. You could hear a pin drop, as the students stepped up, mostly one by one, and read out each of the 17 names. Then the student performances begin. Students were invited to create an original piece no longer than 2-3 minutes covering a variety of important people and events during the Revolutionary War period. The students presented a mixture of serious and funny poems and songs--some even brought their ukuleles and guitars. Molly Monahan, an A.C. Davis High School junior from Yakima, WA, rapped about Thomas Paine’s (or, T-Pain, as she referred to him) “Common Sense.” Esai Contreras, a junior from Rainier Beach High School in south Seattle--a school that recently received a $10,000 donation from NBC’s R.I.S.E. America grant, which helps fund Title 1 schools for their musical theater education--something the schools in our area are particularly passionate about--performed a rap about Alexander Hamilton. He first recorded the rap in his closet at home. 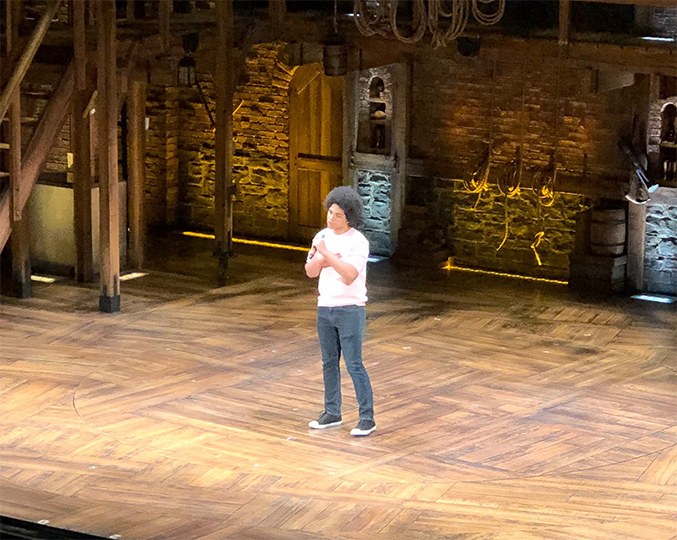 Esai Contreras performs his Hamilton Rap at EduHam on March 14. “It’s super, super nerve-wracking to be up there,” says Olivia McCabe, a junior from Mount Rainier High School in Des Moines, WA. She performed a song with her ukulele about the Boston Tea Party. “Everybody was encouraging each other [backstage],” says Alexis Coronado, a junior from Othello High School in Othello, WA, who also played her ukulele and sang about Paul Revere’s ride. She admitted that this was her first time on stage and the only people who have ever heard her sing before were her grandpa and her dogs. Olivia McCabe (left) and Alexis Coronado (right) performed their original works at EduHam on March 14. There was definitely air of camaraderie, with everyone cheering each other on, even when a student forgot the lines to his poem. “Keeping going!” someone yelled from the balcony. The whole point of EduHam is to help high school students dive deep into American History and learn through music and performance. Both Coronado and McCabe agreed that participating in this program made them learn more about the specific historic events each of them chose to focus on. Plus, getting to see Hamilton for $10 is the cherry on top of the experience. “We are as excited to be here and see them perform as they are to see Hamilton,” Brooks says. After the student show, members of the cast sat down for a Q&A and answered some tough questions about race and how playing people who thought slavery was OK affects the actors. “It’s something I think about all the time but after you see the inspiration that’s brought on to other people through it you kind of go, ‘Well that’s a necessary evil that I have to get through everyday,’” says Kyle Scatliffe who plays Marquis de Lafayette and Thomas Jefferson. Another cast member chimed in when asked about what issues still affect us today that were prevalent during the Revolutionary War period. “Racism and inequality is still relevant...we struggle with it as a nation,” says Ta’Rea Campbell, who plays Angelica Schuyler, whose answer was greeted with loud cheering from the whole theater. After the Q&A and a quick lunch break, the students watched Hamilton, with scenes like the first Cabinet battle completely bringing the house down. The students definitely did their homework since the little historical jokes got big laughs (and they even gave Hamilton a smattering of “boos” after the Reynolds affair scenes). EduHam brought the best of learning and music together under one roof. At the end of the day, Brooks and the program leaders want the students to be able to see themselves in the people on stage and be respectful of all. Witnessing this student show, and the inspiring actions of kids across the nation who participated in the walkout the same day, one can't help think that our future is in good hands.